FEED THIS PRODUCT FREE CHOICE TO CATTLE RECEIVING RATIONS COMPOSED LARGELY OF GRASS HAY OR TO CATTLE GRAZING RANGE OR GRASS PASTURES. OPTIMUM INTAKE IS 4 OUNCES PER HEAD PER DAY. 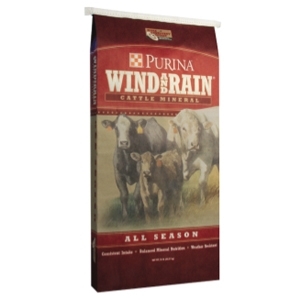 CATTLE RECEIVING PHOSPHORUS DEFICIENT DIETS MAY OVER-CONSUME THIS PRODUCT WHEN IT IS FIRST OFFERED. PLACE THE MINERAL FEEDER NEAR THE WATER SUPPLY OR IN THE ANIMALS' LOAFING AREA. PUT OUT FRESH MINERAL AT LEAST ONCE PER WEEK. FEEDING FREE CHOICE SALT IS NOT REQUIRED WITH THIS MINERAL. PROVIDE FRESH, CLEAN WATER NEAR THE FEEDING AREA. CAUTION: Store in dry, well ventilated area protected from rodents and insects. Do not feed moldy or insect-infested feed to animals as it may cause illness, abortion or death.